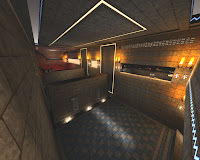 TouLouZ' DeFRaG maps: Oasis-Temple2, second room ! The second room's almost done, need to fill some empty spaces at the bottom of the screen for instance.. Also, some gameplay modifications need to be done, though it'll look roughly the same once the room is finalized. Got no bugs in this room :).